The real time Twitter battle hosted on www.iamthewolverine.com gives fans the opportunity to ‘become’ one of the most iconic Marvel characters through their tweets. The battle consists of three rounds in which the Wolverine needs to defeat the deadly ninja, the venomous Viper and the toughest adversary Silver Samurai, respectively. The outcome of the battle was entirely in the hands of the fans, who had a chance to tweet as the Wolverine by using #IAmTheWolverine or against him by tweeting as his enemies. 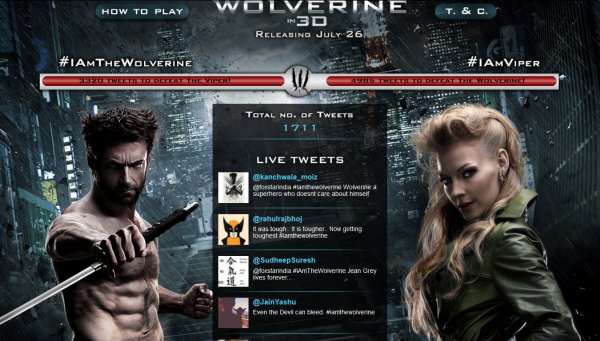 The real-time design of the website showcased every fan tweet made within seconds on the website along with having a direct effect on the health of the characters, making fans realize that the outcome of the battle was completely in their hands and involving them in the story line of the upcoming film, The Wolverine. Fans tweeted non-stop for 62 hours from 24th July 10am till 27th July Midnight (When the battle is over). #IAmTheWolverine trended continuously for 3 days nationally (India trends List). #IAmTheWolverine trended Worldwide on 26th July 2013. A massive 1471 unique twitter participated and tweeted. An astonishing 75,686 total number of tweets and retweets. Total number of tweets: 11178.